Alkene-metal "π-complexes" have what might be called a representational problem; they do not happily fit into the standard Lewis model of using lines connecting atoms to represent electron pairs. Structure 1 was the original representation used by Dewar intending the meaning of partial back donation from a filled metal orbital to the empty π* of the alkene. At the other extreme these compounds can be called metallacyclopropanes (2) in which only single bonds feature (these can be thought of as representing full back bonding from metal to alkene and full forward bonding from alkene to metal). Representations 3 and 4 are a more fuzzy blend of these, implying some sort of partial bond order for the metal-carbon bonds. Taken together, they imply that the formal bond order of the C-C bond might vary between single to double. Structures 1 and 2 in particular imply that there might be two distinct ways in arranging the bonding and that π-complexes and metallacyclopropanes might therefore be distinct valence-bond isomers, each potentially capable of separate existence. Why do these representations matter? 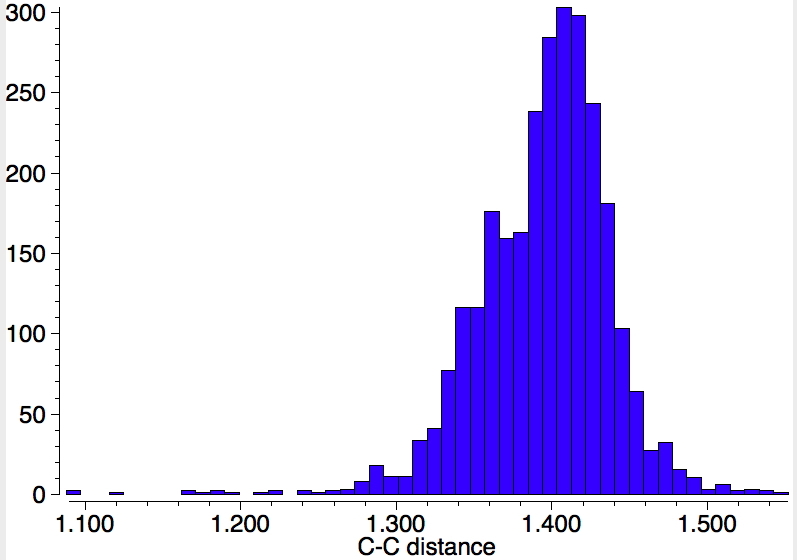 Well, I am going to mine the crystal structure database for these species to try to see if there is any evidence for a bimodal distribution in the C-C lengths, perhaps indicating evidence of the isomerism suggested above. Such a structural database is indexed against atom-pair connectivity in the first instance and then bond type; one can specify the following types of bond connecting any two atoms: single, double, triple, quadruple, polymeric, delocalised, pi and any. 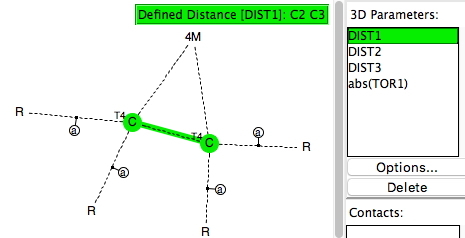 It is not entirely obvious which if any of these types apply to structure 1 (it is not possible to draw a bond ending at the mid-point of another bond using the Conquest structure editor); the dashed lines in structures 3 and 4 could be classed as delocalised, pi, or most generally any. The search query can be constructed thus, where the two carbons carry R which can be either H or C and all four C-R bonds are specified as acyclic (to try to avoid complications by excluding compounds such as cyclic metallacenes). Because representation 1 cannot be constructed in the editor, I am going to specify that each carbon carries four bonds of any type in the first instance. The torsion specified is defined as R-C-C-M and the full queries can be found deposited here. If the metallacyclopropane representation 2 is defined with explicit single bonds, one gets only 22 hits (no errors, no disorder, R < 0.1). 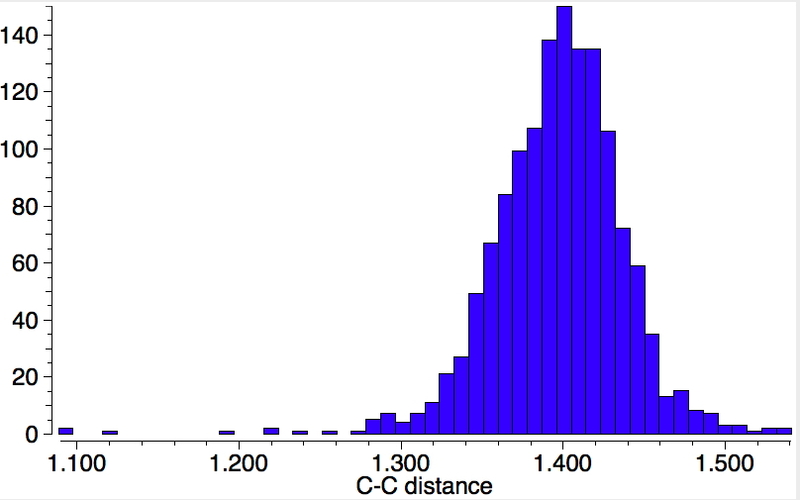 The distribution of C-C bond lengths is shown below. Already one sees a representational problem emerging. 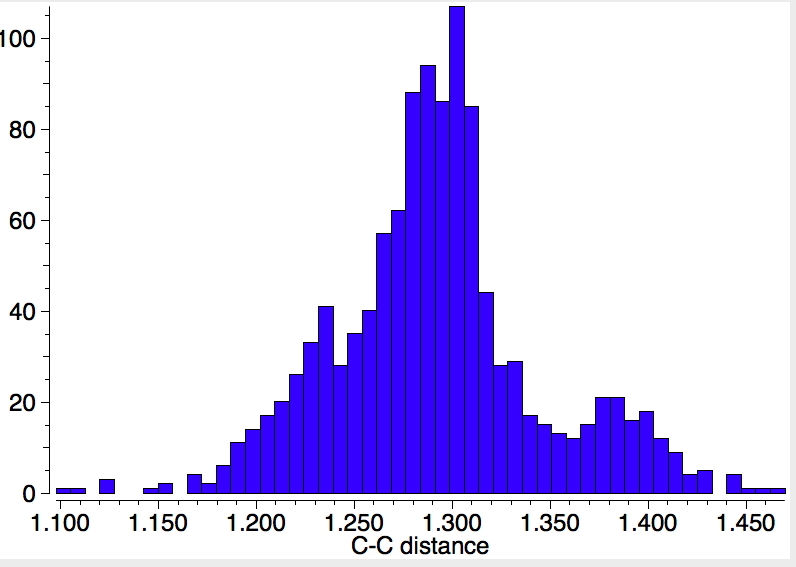 A true metallacyclopropane might be expected to show a C-C single bond length, say > ~1.5Å. But only one or two of these examples actually have this value, the most probable value being ~1.4Å. 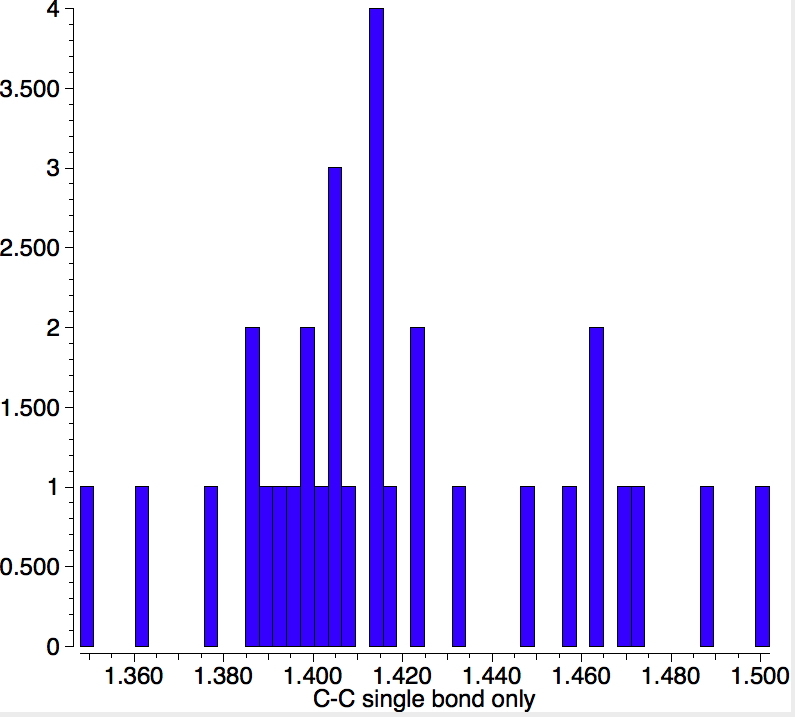 If the C-C bond is also specified as "any", the hits increase to 3948, but the bond length distribution is still very similar, with no sign of any bimodal distribution. Such a distribution is however found if the torsions between the R-C bond vector and the C-M bond vector are plotted (for all types of bond). 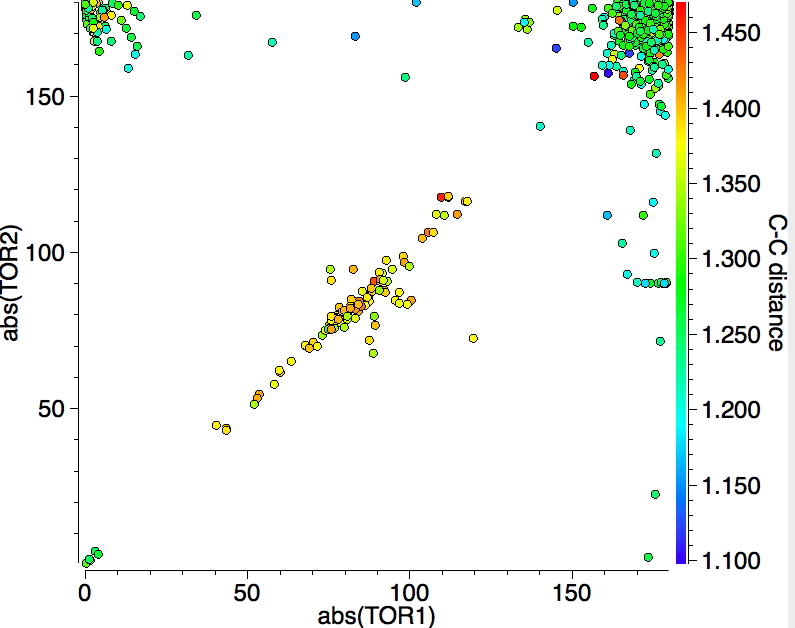 A large number of the complexes have a torsion <90°, which suggests that in fact the substituent R is probably interacting with the metal (even though this would lead to formal cyclicity, specifying R-C as acyclic does not detect this interaction). 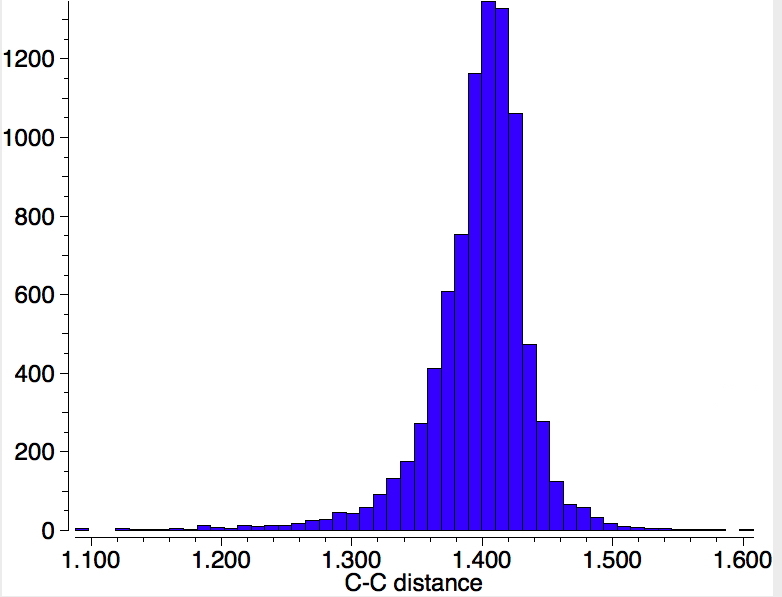 Could this be masking a bimodal distribution in the C-C lengths? 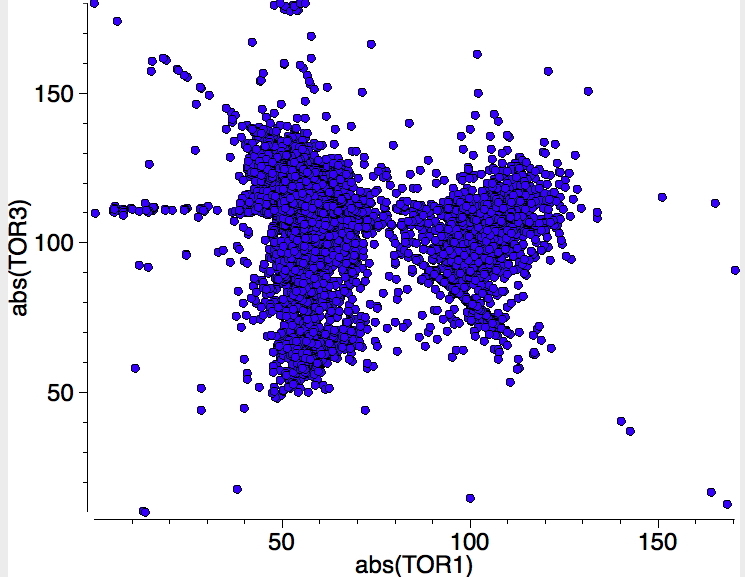 If the previous search is repeated, but this time specifying that all four torsions must lie in the range 90-180° (the range expected for a "classical" alkene-metal complex and selecting only the top right hand side cluster in the plot above) the reduced value of 1051 hits are obtained, but the monomodal distribution remains. 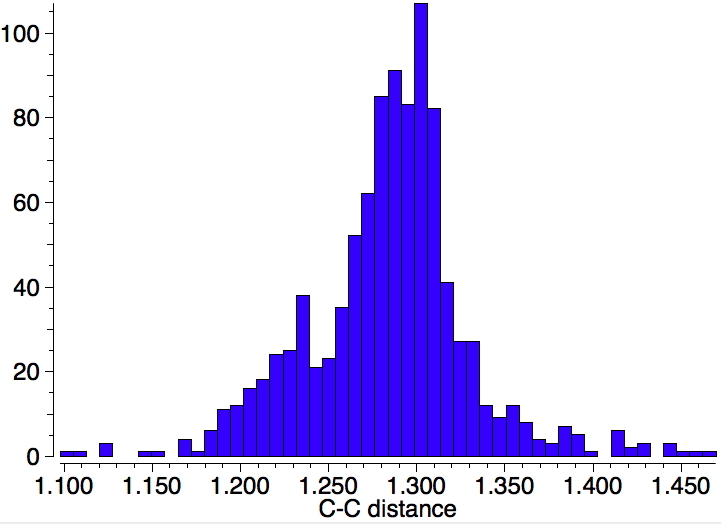 For this last set, here is a plot of the two C-metal bond length, with colour indicating the C-C bond length, indicating the two C-metal bonds are clearly linearly correlated. One final variation; the atom on either C can only be H or a 4-coordinate (sp3) carbon; 645 hits. Again, a monomodal distribution centered at 1.4Å. So this foray through metal alkene complexes suggests that there is a continuum between the formal metallacyclopropane with a C-C single bond and the only slightly perturbed alkene-metal complex with a C=C double bond. Whilst this would not prevent any one of these compounds existing as two distinctly different valence-bond isomers, it makes it very unlikely. I had noted in an earlier post that for molecules of the type RX≡XR (X=Si, Ge, Sn, Pb) that there was indeed a clear bimodal distribution of the X-X lengths evident in the crystal structures (for a relatively small sample number). The structures 1-4 shown at the start of this post are all simply just variations in a continuum and not distinct isomers. POSTSCRIPT: I noted above the bimodel distribution in compounds involving formal triple bonds. So I repeated the search above for π-complex metal-alkyne complexes. Specifying an acyclic C-R bond, and any for the CC bond type, one gets the following. There is now a tantalizing suggestion of two clusters, one at 1.3 and another at 1.4Å. 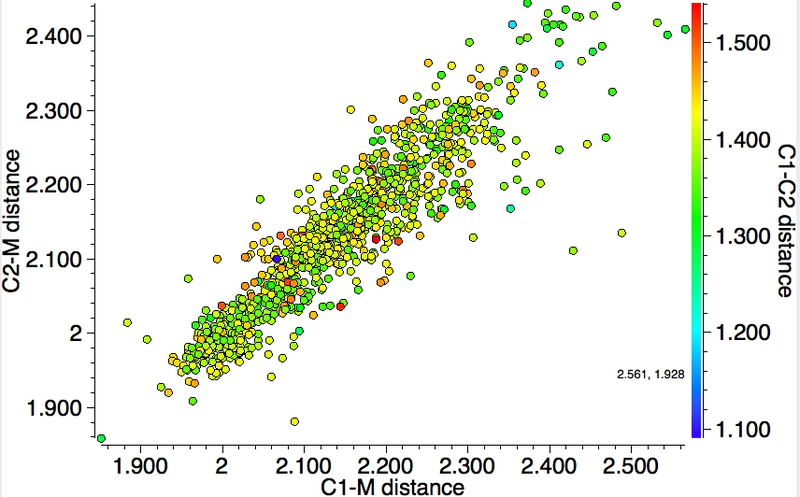 The torsional distribution shows that the latter distance appears to be associated with much smaller torsions, whereas the top right cluster is associated with shorter lengths. If the torsions are restricted to the range 90-180, then the histogram looses the smaller cluster, and perhaps gains a second cluster at 1.22Å? As I said, all quite tantalizing! ‡The tail in all the histograms extends into the 1.1-1.3Å region, which seems unreasonable for a carbon where four bonds are specified. This region probably represents errors in the crystallographic analysis or reporting. But who knows, perhaps some very unusual compounds are lurking there! This entry was posted on Monday, June 13th, 2016 at 1:58 pm and is filed under crystal_structure_mining. You can follow any responses to this entry through the RSS 2.0 feed. You can leave a response, or trackback from your own site. A wider look at π-complex metal-alkene (and alkyne) compounds. is licensed by Henry Rzepa under a Creative Commons Attribution-Noncommercial-Share Alike 3.0 United States License.